Now that we’re down to the penultimate episode of the third season of The Walking Dead, I was expecting things to be heating up into a frenzy that would lead to the conclusion. Instead “This Sorrowful Life” kind of meandered toward what we know must be a showdown with the Governor (David Morrissey). There were some good things in this episode, but I couldn’t help but feel a little underwhelmed by the whole thing. The second half of this season has lacked the excitement of the first half. The episode did end with an unexpected bang, but I’ve been questioning if that was the right choice for the show. Faced with the decision of whether or not to give up Michonne (Danai Gurira) to the Governor, Rick starts the journey toward finding himself again. He’s on the verge of making the selfish decision to turn her over, but a glimmer of the old Rick starts to emerge. He starts to become a person concerned about the greater good, rather than just merely surviving. He’s more like the man we met in the first season, which makes sense given they went back to where he started a couple of episodes ago. His epiphany comes just a little too late though. He has already told Merle (Michael Rooker) about the plan to deliver Michonne to Woodbury. Merle decides to take matters into his own hands. Merle doesn’t care at all about being part of the group. As he tells Carol (Melissa McBride), he’s only there because of his brother. He takes Michonne and heads toward Woodbury without telling anyone his plan. Merle’s storyline is the best part of this episode. There’s complexity to it, something that’s been missing from the show. At first it appears he wants to take Michonne so he can redeem himself to the Governor, but then things become unclear. Maybe he’s doing it so Rick won’t have Michonne’s blood on his hands. He’s saving Rick from having to do a terrible thing. 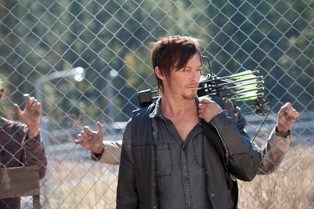 He’s also saving Daryl (Norman Reedus) from having to play the part he once played to the Governor. Daryl is willing to go along with whatever Rick says to do, just out of loyalty. That might seem a little too sophisticated for Merle, especially considering he was scouring the prison for drugs and booze. But a person’s sense of self-worth can be a powerful thing. 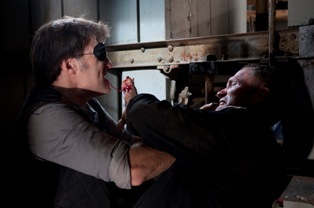 Ultimately he decides he wants to take down the Governor himself, thus saving everyone from the eventual battle. In a moment of mercy, Merle lets Michonne go, heading off on his own. It was at that moment I began to suspect Merle wouldn’t make it. He finally does something good, so now we care about him. And I mean really care about him, not just feeling like he’s a cool character. He shows he has a heart, so we can feel sad if and when he’s gone. I thought it would happen in the next episode, but I was wrong about. The Governor gets to Merle before Merle can get to him and that’s the end. Well, kind of the end. 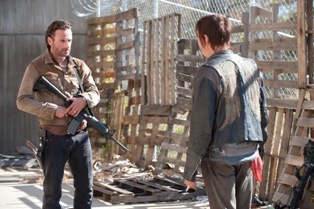 Daryl, who has gone after his brother, finds zombie Merle and is forced to put an end to him. It’s sad for Daryl, who has only just been reunited with his brother. They didn’t get much of a chance to make things right with each other. Will this make Daryl more loyal to Rick, or will he turn bitter? It’s hard to say. I have mixed feeling about Merle getting killed. Not just because I liked the character, but because he was good for the show. He was interesting, he provided some real tension between the characters, and he was a good for a reality check every once in a while. At the very least, his death made a big impact on the show. The other elements of the episode were less interesting. I have to confess I couldn’t care much less about the romance between Glenn (Steven Yeun) and Maggie (Lauren Cohan). I don’t have a problem with it, I just don’t really care if they get married or not. I know his proposal was supposed to symbolize hope for a civilized future. I just wasn’t interested in it for this episode. The fate of Andrea (Laurie Holden) was left for next episode. She didn’t appear in this one. Tyreese (Chad L. Coleman) was also absent. I had thought he would take a bigger role, but I guess we were just getting a brief introduction. I suspect we will see more of him next season. 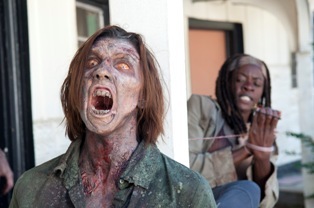 Next week will wrap up The Walking Dead season three. I’m hoping for some excitement, along with something that will entice the next season. Hopefully some surprises will occur to spin the story in a new direction. This season started out so great and now it has really just fizzled. Idk if they were trying to prolong the showdown til the very end or what. I think they could have done it earlier than this and still had enough plot to last the season. I was bawling over Merle’s death. Michael Rooker is an awesome actor and I will miss him. Daryl crying just made me lose it! I hope this last episode redeems this half of the season. I totally agree Christy. I feel like they could have wrapped this storyline up about half way and then moved on to other things. The last half of the season seems like it’s stretched. I am also feeling the same about the second half fizzing out and I really am mad about merle, they always do this, you know just when you start to really care, they get killed off, grrrr! i had mixed feelings about Merle too. I definitely did NOT care for him in the first season. We barely knew him back then, but he wasn’t likable for obvious reasons. Nah… but The Governor was never in any danger of dying in the penultimate episode.